Suntech employees at work in China. China's Suntech Power has put its largest subsidiary into bankruptcy, a casualty of rampant oversupply in the solar industry and punishing sanctions levied on Chinese panel producers. The bankruptcy filing, made in Jiangsu Province, marks the end of a long downward spiral for Suntech's Wuxi subsidiary, once a darling of the solar industry and one of the world's largest panel producers. Declining prices for solar products and global trade spats have taken a toll on the nascent solar industry in recent years, leading to the failure of several firms heavily dependent on government support. Parent company Suntech Power (STP), listed on the New York Stock Exchange, will not file for bankruptcy. But the company's share price is now trading around 60 cents, down from $50 in 2008. Wuxi accounts for about half Suntech's 20,000 employees. A group of eight Chinese banks petitioned a court in Jiangsu Province on Wednesday in an effort to push Wuxi Suntech into bankruptcy, and the subsidiary said it would not object. Last week, the company missed a payment on $541 million in debt, and the company's CEO said he was exploring strategic alternatives. According to state-run news agency Xinhua, the company owes nine creditor banks a total of $1.2 billion. Suntech announced last week it was closing a manufacturing center in Goodyear, Arizona, costing 43 workers their jobs. "These are the growing pains of a maturing industry," E.L McDaniel, managing director of Suntech America, said at the time. "Though it's a tough time to be a solar manufacturer, there's never been a better time to be a solar customer." China's solar manufacturers maintain close ties to the state, and have been hammered in recent years as demand for solar panels has lagged far behind supply. Yet they continued to receive favorable treatment from the government in the form of bank loans. Many of China's solar firms used the loan money to increase production, even as they haemorrhaged cash. There is still a chance that government intervention will save Wuxi Suntech, with the most likely suitor being Wuxi Guolian, a development company backed by the local government. 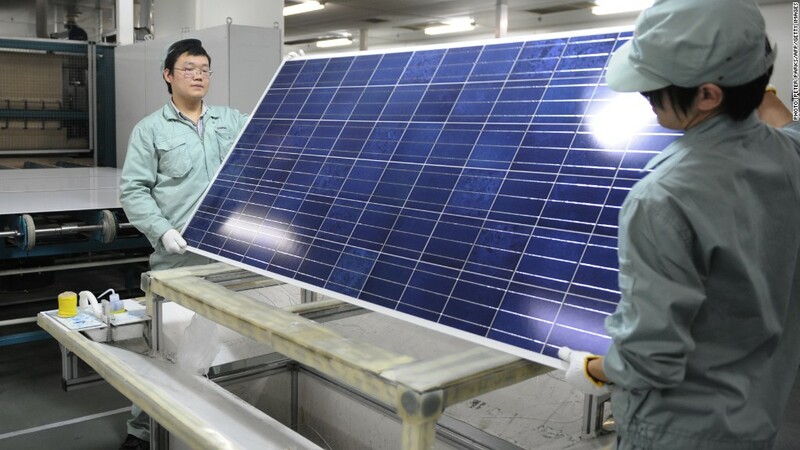 The U.S. Commerce Department announced stiff tariffs on Chinese-made solar panels last year, after finding that Chinese solar cell manufacturers were "dumping" their products on the American market below production costs. The issue divided the U.S. solar industry, with some manufacturers complaining that Chinese trade practices were driving prices down artificially and smothering U.S. production. U.S. manufacturer Solyndra became the highest-profile victim of plunging panel prices in 2011, forced to file for bankruptcy despite receiving $535 million in federal loan guarantees.